Ah. I loved this book. Sometimes, I want to dive into a fairy tale. Most of the time, that means at a cost…of believability, of depth of character, there’s usually something. But with Meyer’s writing, I’m able to lose myself in a rich world full of possibility. The characters are unique, and the story is wonderful. Although Scarlet is about a different character and Cinder has a much smaller role, the story didn’t lose it’s heart, and I loved it from beginning to end. How about Marissa Meyer just writes all the books from now on, yes? Kidding. Kind of. But only because it’s impossible. Most of the book has new characters. The classics: Scarlet (love), Grandma (love), Wolf (drool). And Mr. Carswell Thorne as well, who manages to luck out and cross paths with Cinder as she’s breaking out of jail. Well he’s a hoot and a half, and they are quite the team. Sadly, not much of Kai in this book, but that’s okay, because I know it’s coming, and the anticipation is tasty. I was DEAD WRONG. So glad I gave them a chance! Everything was dead on: writing style, characters, setting, plot, even the book covers are beautiful. So I leave you with a very full 5 stars for this book, as I sit and wait, quite impatiently, for Cress. Obviously, I highly recommend this series to anyone with both a brain and a heart. HAHA I would LOVE if Marissa Meyer wrote all the books!! Seriously, I ADORE her writing. The characters, the worlds, the twisty plots… I’m totally a fan for life. 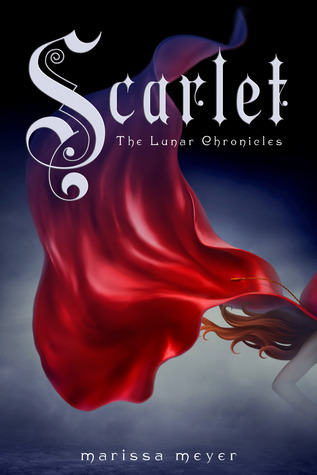 These books are amazing and Scarlet totally blew me away! Just wait until you read Cress now… omg. Marissa Meyer is a genius!! I can’t wait to read it…I’m going to be so busy reading in Jan-Feb! Too many books…but there’s no such thing, so…yay!